Several years ago, some scientists called Pluto with some bad news. “You’ve been great and all, but we’ve decided that you’re not a planet any more”, they said. Pluto was rightfully shocked. There had been rumors that one of the planets was getting demoted. The consensus was that Uranus, the most inappropriate of all the planets, was getting pink-slipped. “I’m out here on the edge of the solar system. I define the outer limit. I’m so inoffensive and Uranus just begs to be mispronounced. Why me?”, Pluto asked. It’s been a little tough to get my writing done the past few weeks. Unfortunately, I had to go on vacation with my wife and a lot of my other friends. And of course, I picked up a cold as a souvenir. Then I had to have surgery. To clarify, I did not have surgery to cure the cold. Everyone knows you starve and/or feed a cold. I had to have surgery to repair a hernia. Yeah, somehow I ended up with a hernia. Two, in fact. See?! Writing is hard work. I’m a nice guy. There are people who would take issue with that. This isn’t their website, so you’ll have to take my word for it. I am nice. After my last post, I decided that I was going to leave the pumpkin thing alone for this year. The CBS story ran, my friends and family got a kick out of it. But the topic? Yes I was done with it. I’d milked it for all it is worth until next pumpkin season. I even had something written to put here this morning. But because of what I’m telling you about, I’m rescheduling my post entitled Thomas, The Resentful Tank Engine until Monday. Yeah, I Made The Daily Show. Bam. So today, I was going about my morning routine. In the midst of it, I took a moment and peeked at Facebook. In that random way that Facebook does, the first thing on my news feed was a message to my now twenty-three year old son from his middle school band director. My first thought was that she’d just seen the CBS This Morning interview. But then I considered the source. This is an educated, bright woman who I admire. Certainly she knows the difference between CBS This Morning and The Daily Show. And not surprisingly, she does. There I was, cut in to a really funny swipe at the pumpkin thing on The Daily Show! I’ll pause and wait while you click here to go over to the Comedy Central site and see the story. So, yeah, that happened and I never saw it coming…but I love it! I haven’t run a Five Routine Minutes post in a while. For those who haven’t seen one before, this is the most poorly illustrated series on the net. Also, many times, what’s depicted doesn’t even add up to two minutes. But I like the idea as a goofy way to tell a story, so I’m resurrecting the series. My wife has had to work a few recent weekends. That’s not typical and we’re taking it in stride. She’s done a lot of it at home. But this weekend she knew there was an event I wanted to attend. 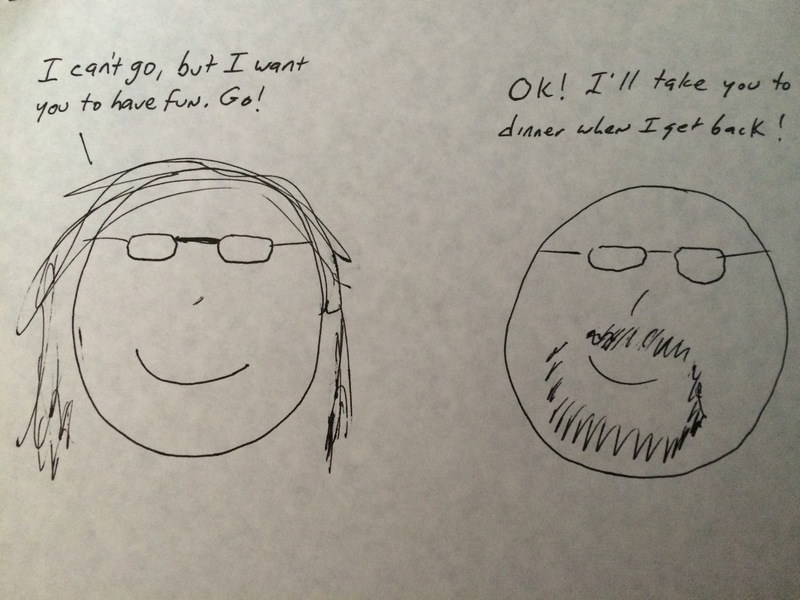 Artist’s note: Despite what the drawing shows, my wife does not look like me. That would be creepy. Also, my goatee does not make my face look fat.